Named for the Zulu and Xhosa word for “power,” Amandla was born in Los Angeles on October 23, 1998, to Karen Brailsford and Tom Stenberg. Her mother is African-American and her father is Danish (and of part Inuit-Greenlandic ancestry). Amandla landed the first of her Disney catalog modeling shoots when she was four years old. She has shot numerous commercials, most notably for McDonald’s with Ronald McDonald himself, for Walmart with DJ Tony of The Ellen DeGeneres Show (LeVar Burton aka Kunta Kinte directed), and for BuildTheDream.org. This moving, Boeing-sponsored PSA, which raised funds for a national memorial in Washington, D.C., honoring Martin Luther King, Jr., premiered during the weekend of President Obama’s inauguration in January 2009 on Meet the Press and other NBC/MSNBC programs. On October 16, 2011, Amandla was invited by the MLK Memorial Foundation, along with such luminaries as Jesse Jackson, Tommy Hilfiger, Dan Rather, Stevie Wonder and Nikki Giovanni, to participate in the memorial’s dedication ceremony. After an introduction by actress Cicely Tyson, Amandla paid tribute to the four little girls who were killed in the Birmingham church bombing. In April 2011, Lionsgate announced that Amandla had landed the coveted role of Rue in the screen adaptation of Suzanne Collins’ popular young adult series, The Hunger Games. The news was greeted with overwhelming support by fans, and the highly anticipated film opened in theaters on March 23, 2012, to much acclaim and big box office numbers. The Los Angeles Times noted “the presence of young actress Amandla Stenberg, who makes a powerful impression as 12-year-old Rue.” Time magazine said Amandla “adds underage winsomeness as Rue,” and Variety called her a “winning newcomer.” For her heart-breaking performance, Amandla earned an NAACP Image Award nomination for Outstanding Supporting Actress in a Motion Picture and a Black Reel nomination for Best Breakthrough Performance. She also won (with Jennifer Lawrence) a Teen Choice Award for Choice Movie Chemistry and a Black Reel Award. To promote the movie, the young actress, who was featured in a Hunger Games movie poster, graces the cover of Scholastic’s Tribute Guide and has her own Rue doll, traveled around the country greeting fans and signing autographs on Lionsgate’s mall tour. She also conducted numerous print, television and video interviews with media outlets such as Entertainment Weekly, People, Us Weekly, Publisher’s Weekly, Seventeen, Essence, Vanity Fair, E! News and The Wall Street Journal. Singled out as one of Hollywood’s young stars to watch by Rolling Stone, Paper and Ebony, Amandla made her mark as a fashionista, landing on magazine covers (Girls’ Life and Justine), and earning kudos for her red carpet style. In November 2013 Amandla began a guest-starring, four-episode arc playing Macey, the daughter of Captain Irving (Orlando Jones), on the first season of Fox’s Sleepy Hollow. Amandla appeared as series regular Halle Foster on NBCUniversal’s Mr. Robinson opposite Craig Robinson in the summer of 2015. In January 2016 she traveled to Park City, Utah, to attend the premiere of her latest film, As You Are, which won a Special Jurat the Sundance Film Festival. Amandla appears in the visual album Beyoncé: Lemonade (2016). In March 2016 Fox 2000 won a heated bidding war for Angela Thomas’ debut novel, The Hate U Give. with Amandla attached to star. The actress is also slated to star in the YA adaptation Everything, Everything (2017), the Amma Asante World War II vehicle, Where Hands Touch (2017) and the sci-fi thriller The Darkest Minds. In addition to on-camera jobs, Amandla has put her sensitive ear to work in ADR gigs for both film and television. Amandla lent her voice to Rio 2 (2014) playing a high-flying, feathery spawn of Anne Hathaway (Jewel) and Jesse Eisenberg (Blu). A gifted musician, Amandla plays the violin, drums and guitar. In 2009, she performed the violin with the Los Angeles Unified School District’s Honors Orchestra at the Luckman Fine Arts Complex. Her involvement with the Rock STAR Music Education program landed her gigs at the House of Blues and the Hard Rock Cafe, as well as a studio session with producer/engineer Gerry Brown, after her band won RockSTAR’s Battle of the Bands. In 2013 Amandla began performing on the violin and singing harmonies at LA venues such as Genghis Cohen, Room 5 Lounge and Amplyfi with singer/songwriter Zander Hawley. The folk-rock duo known as Honeywater released a self-titled first EP in August 2015; a second, “Wonder,” dropped November 2016. When she’s not making music, Amandla is making noise on social media. Declared “one of the most incendiary voices of her generation” by Dazed magazine, which featured Amandla on the cover of its Autumn 2015 issue, the social activist helped catapult the topic of cultural appropriation into public discourse when she posted her school project video, “Don’t Cash Crop My Cornrows” on her Tumblr. Time Magazine named her one of The 30 Most Influential Teens of 2015 and 2016. 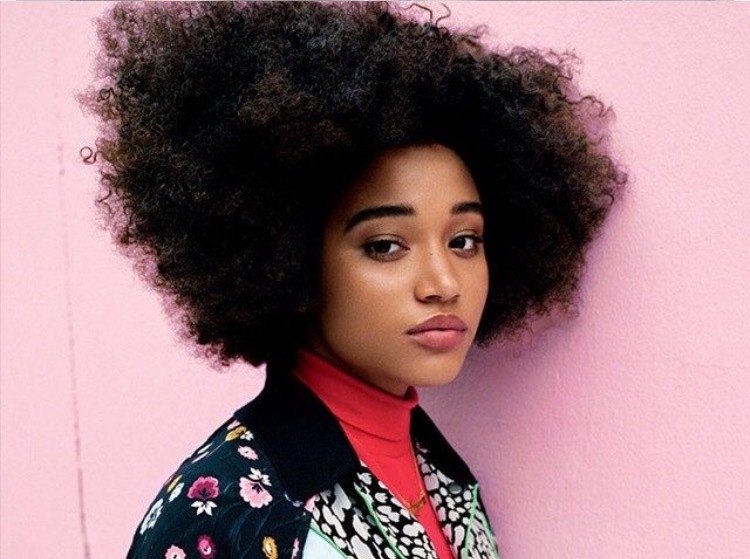 Amandla appeared on the cover of Teen Vogue’s February 2016 issue, for which she was interviewed by Solange Knowles. ELLE UK dubbed her an “icon of change” on its September 2016 cover while Interview called her “a new progressive” on its cover. Amandla interviewed (and danced with!) Gloria Steinem for Teen Vogue’s September 2016 issue. Oprah Winfrey has taken note of Amandla’s activism and invited her to give a talk (“My Authenticity Is My Activism”) for SuperSoul Sessions Series 2 at UCLA’s Royce Hall in April 2016. Highlights were featured on SuperSoul Sunday. Black Girls Rock! honored Amandla with the Young, Gifted and Black award and she is also the winner of the BET Awards’ YoungStars award. The Ms. Foundation for Women named Amandla (along with Rowan Blanchard “Feminist Celebrity of the Year” for 2016. Amandla is co-author, with Stranger Comics’ Sebastian Jones, of the comic book series Niobe: She is Life. She is a youth ambassador for No Kid Hungry (Jeff Bridges serves as spokesperson for the charity’s umbrella organization, Share Our Strength) and supports the Ubuntu Education Fund, which nurtures children “from cradle to career” in Port Elizabeth, South Africa.